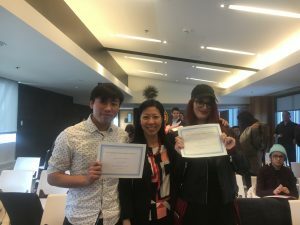 CUE students Emmanuel Imperial and Caitlynn LaFleche from the Faculty of Arts participated in the 7th Alberta Chinese Bridge Speech Competition for University Students on March 17, 2018 and won 2nd and 3rd places! Emmanuel and Caitlynn are students enrolled in CHIN 102 (Beginner’s Chinese II) taught by Dr. Xinxin Fang. The Chinese Bridge Speech Competition for University Students is an international Chinese language and talent competition for university students. Each country will host preliminary rounds and nominate the winners for the final competition in China. Details of this worldwide competition can be found at http://english.hanban.org/node_8080.htm. The competition Emmanuel and Caitlynn participated in was Alberta’s preliminary competition, which took place at University of Calgary last Saturday. The organizer of the event is the Chinese Language Teaching and Research Association with the support from the Chinese Consulate General in Vancouver and Hanban. 24 students from the University of Calgary, University of Alberta, Mount Royal University, and Concordia University of Edmonton participated in the competition. Emmanuel’s Chinese speech was about China and his love of drawing. Caitlynn’s Chinese speech was about the treasures in her Chinese bag. Both speeches were creative, humorous and reflected what they have learned about Chinese language, culture, and traditional and modern Chinese society. The event was supported by the Department of Literature and Language, Faculty of Arts at CUE. Congratulations Emmanuel and Caitlynn! Please enjoy and celebrate the moment by playing the short video below.